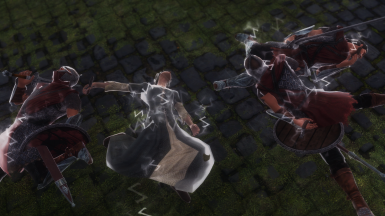 A rework and update of Dragon Age spells, now featuring 21 spells with unique, custom art and mechanics from the world of Thedas. 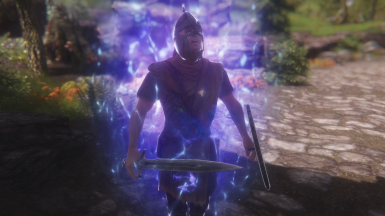 A heavily rewritten and optimized update of Dragon Age Spells, which was last updated back in 2017. 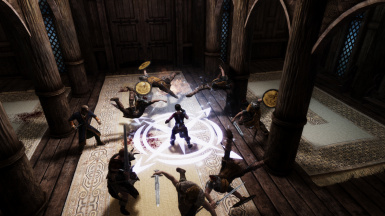 15 new spells from all three Dragon Age games are added in this update, totaling 21 spells, including some much requested fan favourites like Crushing Prison and Walking Bomb. 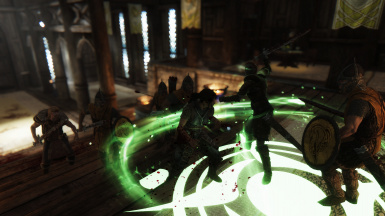 Much effort was taken to ensure that the spells resemble their Dragon Age counterparts in terms of visuals and mechanics. Extensive balance changes have also been made since the last update to ensure that spells don't feel too weak or OP. 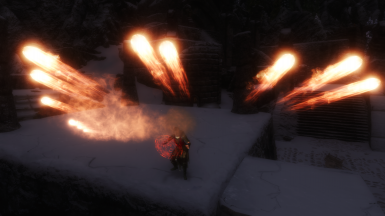 Like Dragon Age, this mod features a cooldown system so spells can't be spammed continuously. This is for balance, and technical reasons. However, not all spells have cooldowns. Some spells can be combo-ed with each other, resulting in new and unpredictable effects. 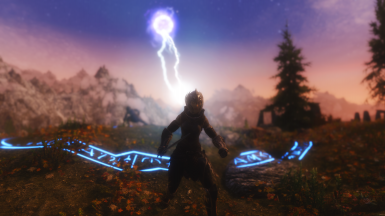 These spells are sold by all court wizards, across Skyrim. Wait 48 hours for the new spells to spawn. ﻿Encloses a target in a collapsing cage of telekinetic force, which inflicts damage for 12 seconds. ﻿Cursed enemies cannot heal or regenerate health and take continuous damage for 20 seconds. 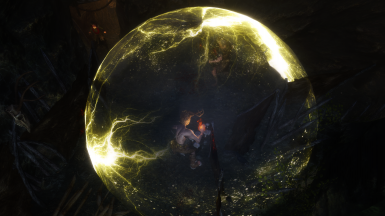 ﻿A bubble of energy that slows and weakens enemies inside it, for 15seconds. Creates a localized earthquake that staggers and knocks down enemies every few seconds, for a total of 20 seconds. Launches a salvo of 12 elemental blasts that homes on your target. Requires an elemental spell to be equipped alongside it. Casts a telekinetic barrier around the target, who cannot move, but is immune to all damage for 18 seconds. ﻿Casts a telekinetic barrier around the caster, who cannot move, but is immune to all damage for 8 seconds. This glyph prevents spell casting and neutralizes all magic within its bounds, for 20 seconds. ﻿This glyph will paralyze up to 3 enemies that cross its bounds for 20 seconds. This glyph will repel most enemies that cross its bounds for 20 seconds. ﻿Summons a grease slick that slows and slips anyone who walks on it for 20 seconds. Can be set on fire. ﻿Enemies are completely drained of magicka and suffer damage proportional to the amount of magicka they lost. ﻿A swirling vortex of energy that draws nearby enemies to its center in an instant. ﻿A swirling vortex of energy that draws nearby enemies to its center for 20 seconds. ﻿All hostile targets around the caster fall asleep for a maximum of 20 seconds. They may wake up early if hit. ﻿Enemies within range are trapped in an electric field that shocks and drags back those who try to leave it, for 12 seconds. ﻿A swarm of insects deals damage for 12 seconds. If the target dies before the effect expires, the swarm will jump to another enemy, up to 5 times. ﻿An ethereal stone fist that deals 25 points of damage when hit and sends enemies flying. ﻿Hostile targets may become randomly stunned or attack other enemies or become the caster's ally for 20 seconds. ﻿Causes a target to take damage for 15 seconds. If the target dies while infected, it explodes and has a 33% chance to infect those nearby. Install with a mod manager such as MO2 or Vortex. Updating from Dragon Age Spells is untested but should work if you re-register the spell cooldown system using the MCM.